The congas are a set of drums played by hand in many types of Latin music, most commonly salsa and other Cuban music. 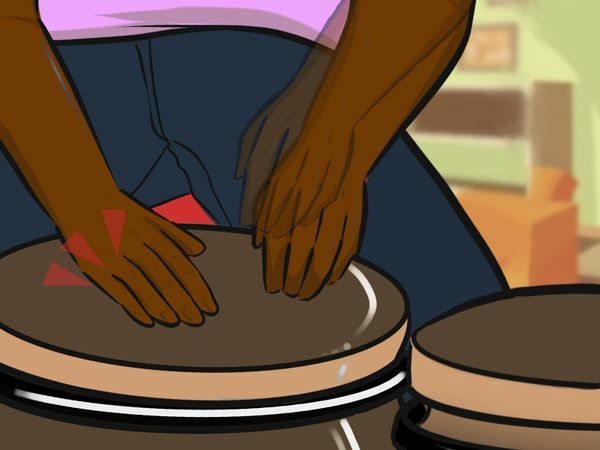 Learn how to position the congas, then learn the basic drumming techniques that you will combine to play a rhythm on the congas. The most common rhythm to play on the congas is the tumbao. 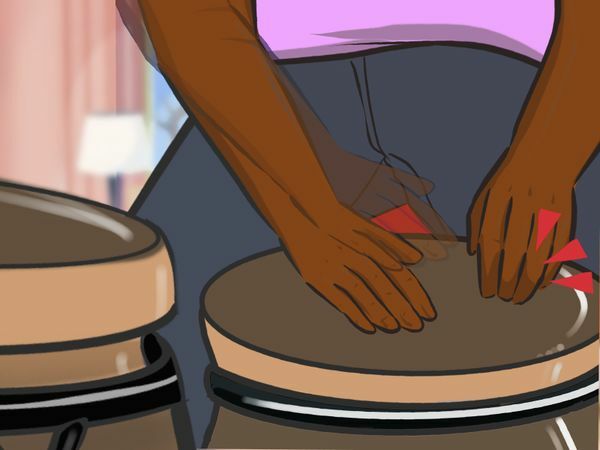 Master the tumbao pattern to be able to play along to all kinds of Latin songs with your congas! Sit in a chair or on a stool with the congas in front of you. Make sure to use a seat that is at the right height to let you comfortably reach out and play the congas. Once you get good at the congas, you can learn to play them standing up as well. There are special stands to hold the congas while you stand. The smaller of the 2 congas is called a quinto. Angle the quinto away from you at a less than 45-degree angle and hold it between your knees. The quinto should be at such a slight angle that if you let it go, it falls back towards you and stands up straight instead of falling away from you on its side. The bigger conga is called a tumba. Push the tumba drum away from you with a knee, outside of your knee, at the same angle as the quinto. You just want the congas to be at a slight angle so that the open bottoms are lifted up off the ground which lets them make sounds properly. The bigger conga is also sometimes called a salidor. Sometimes a 3rd conga is used that is called tres dos or tres golpes, but it’s most common to start learning to play the congas with just a quinto and a tumba. Closed sounds are soft, dull drum sounds. Keep your hands relaxed and hit the conga in the middle with your whole hand at once to make these sounds. You can apply almost all conga drumming techniques to both the quinto and tumba drums. An open sound is a sharp, metallic sound. 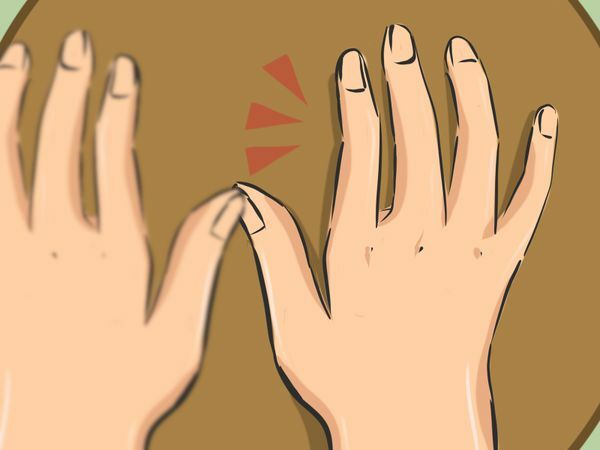 Use the middle part of your palm, underneath your knuckles, to hit the edge of the conga to make this tone. Make sure to always keep your thumbs pointing up so they don’t hit the hard rim of the conga when you play this sound. The heel of your hand will produce a low bass tone. The bass tone is similar to the closed sound but deeper. The heel of your hand is the hard part at the bottom of your palm just above the wrist. Hit the conga with the heel of your hand first, followed by the tips of your fingers to make another sound. 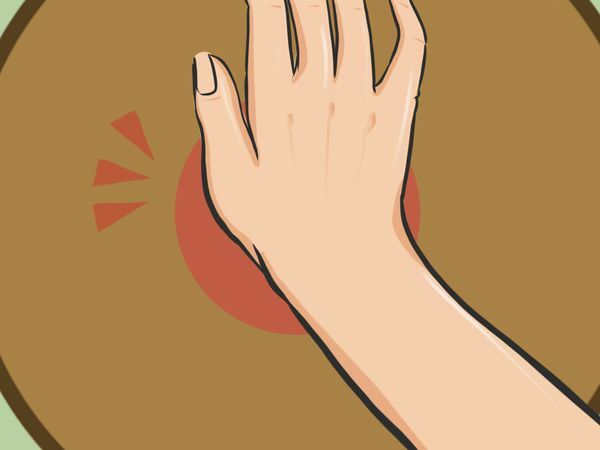 Let your fingertips follow the heel of your hand and slap the middle of the drum. Let the weight of your hand come down on your fingertips. Try to relax your hand as much as possible. If you slap the conga with a stiff hand you won’t produce a sharp slap sound. 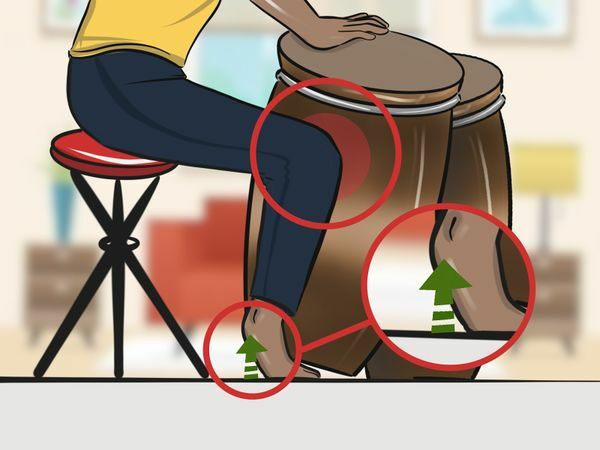 This is the only technique that applies only to the quinto conga. The bigger tumba conga is for playing more bass sounds, so you don’t use it to produce the sharp slap tone. 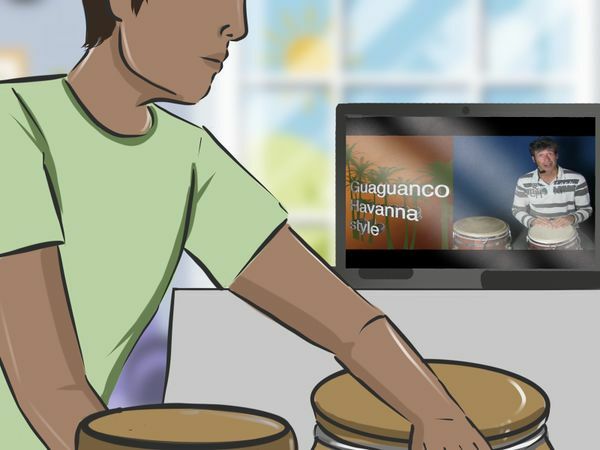 To play the tumbao pattern, hit the quinto with the heel, then fingertips, of your left hand and leave it against the conga. Slap the quinto with your right hand next. Hit the middle of the quinto with the fingertips of your left hand, followed by the heel, then play 2 open tones with your right hand. Memorize the tumbao pattern as heel, tip, slap, tip, heel, open, open and repeat this over and over again until you can play it. The tumbao is an Afro-Cuban rhythm that is used in many types of Latin music, such as Salsa and Son Cubano. A bar is a complete set of the moves you use to play the tumbao Alternate between playing the tumbao on 1 and on 2 congas for variety. To play the comparsa pattern, alternate between your right and left hands and play the open tone 4 times on the quinto. Play 1 open tone on the tumba with your right hand next, then repeat the pattern. You can speed up or slow down this pattern to make different rhythms. When you get good at the congas, you can add a third drum in to mix up this pattern. This is a more complex Cuban rhythm. It’s helpful to watch a video tutorial for this rhythm to practice until you get the hang of it to play this pattern: Play an open tone with your right hand on the tumba, then a slap with your left hand on the quinto, and an open tone with your right hand on the quinto. Play another slap with your left hand, followed by an open tone with your right hand, on the quinto. 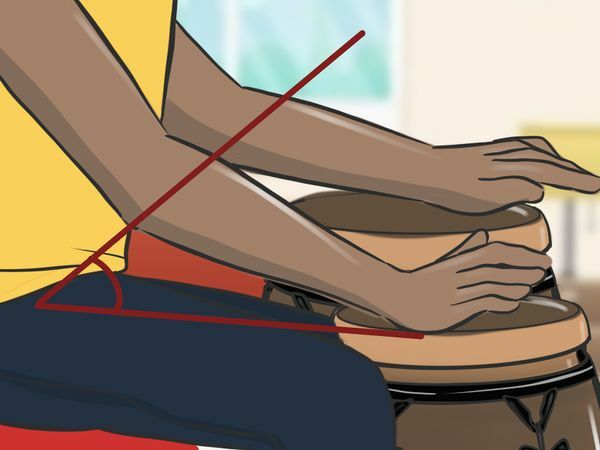 Play a slap with your left hand on the quinto, an open tone with your right hand on the tumba, and another slap with your left hand on the quinto. Slap the quinto with your left hand, then your right hand, then play a bass sound on it. Finally, finish the pattern with 1 slap from your left hand on the quinto, then start the pattern over. There are tons of video on YouTube that break down different patterns for you. Follow along to these videos to learn more complex patterns. 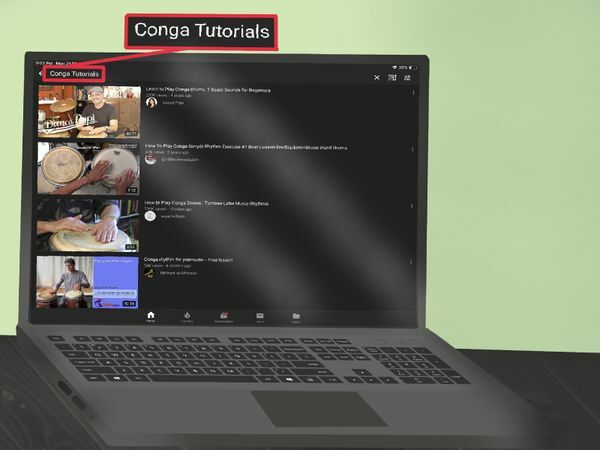 Use search terms like “conga tutorials” or “how to play the congas” to pull up videos. You can also search for specific types of music that you want to learn how to play. 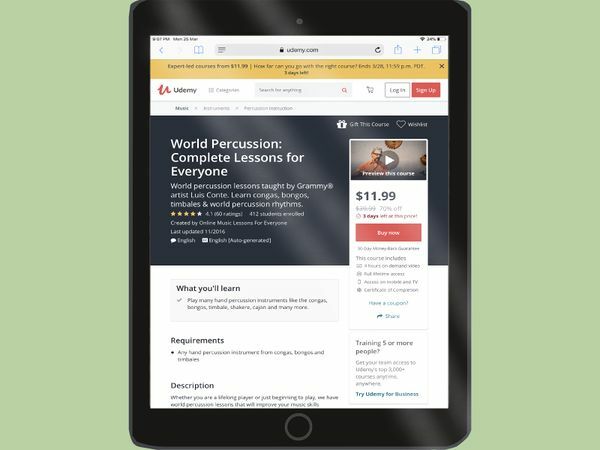 There are many free or affordable online music classes. Search online for a course that meets your skill level and budget requirements and sign up for it. 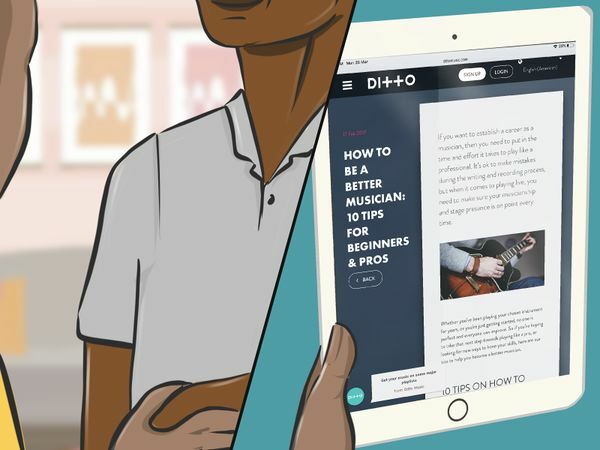 These online music courses usually break down courses into easily digestible video classes, so you can learn on your own time. Taking lessons in person from a professional will help you become a better conga player. Search online or in the local classifieds to find a drum teacher who will be able to help you improve your skills. If you don’t have the budget for private lessons, maybe you have a musician friend or acquaintance who you can make a deal with.